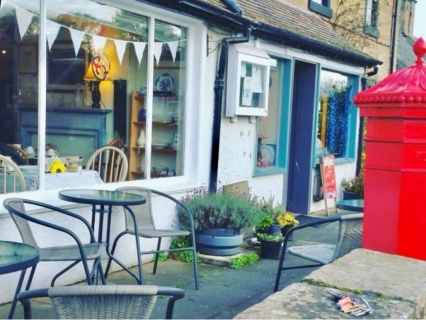 Central Business Sales is delighted to offer to the market a delightful and well established tea room and vintage shop, located in the ever popular East Neuk of Fife. The business started trading in 2014, and it has been operated at various times by the owner as well as the staff team. Being on the Fife Coastal Path, has been a major source of referral and repeat business with walkers, who enjoy the sunny patio for refreshments. The award winning local beach also benefits the business, as well as the many golf tourists playing and attending major events like The Dunhill Cup at Kingsbarns, and The Open at St. Andrews. The tea room seats 12 inside and 15 outside on the patio. There is scope to reduce the gift shop display and increase the covers to 30. Customers enjoy a variety of locally produced home baking, soup, freshly made sandwiches & toasties, and a range of teas and freshly brewed coffee. All served with pretty vintage china. There is also a take away menu. The gift shop offers a range of vintage products including clothes, gifts, antiques, jewellery and hand crafted items. The large premises are approximately 70m² and are in very good condition. There is a wide double frontage, one door is used to guide customers to the tearoom via the retail side of the shop. There is a good sized serving/preparation area and a well equipped kitchen with plenty of daylight via a good sized window. There is also a storage area and a WC at the rear of the tea room. The business is being offered on a leasehold basis with a brand new 10 year lease available. The rent is £8,800 per annum and the business benefits from 100% rates relief under the Small Business Bonus Scheme. The shop is currently open 5 days a week, Friday to Tuesday, with longer opening in the summer months.